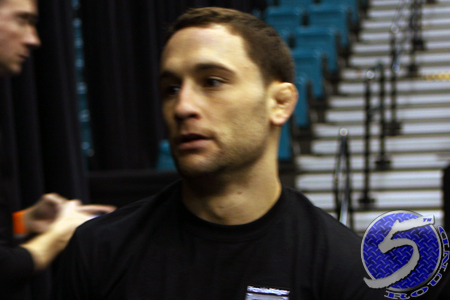 As expected, former UFC lightweight champion Frankie Edgar (Pictured) has finally decided to move to the featherweight division. “The Answer’s” transition was announced during this week’s edition of FUEL TV’s UFC Tonight. Edgar is hoping to make his 145-pound debut in December. No opponent has been named. After losing his lightweight belt to Benson Henderson at UFC 144 and failing to recapture the strap in their rematch earlier this month, UFC president Dana White made it clear Edgar wouldn’t get another crack at the 155-pound crown for quite some time. White has been pushing the undersized lightweight to shed 10 pounds for over a year, but it’s easy to forget Edgar is the same man that beat BJ Penn, who many believed was the division’s G.O.A.T. prior to facing Edgar, on back-to-back occasions. He also went on to knockout a much larger Gray Maynard last October, and both of his decision losses to Henderson were covered in controversy – particular Part II where most think Edgar won. Edgar is the only fighter in UFC history to compete in six consecutive title fights, with half of them being of the rematch variety. White previously stated the 30-year-old will have to post at least one win at featherweight before earning a title bout.